Unless you’ve been living under a rock for the past two decades, you’ve probably heard of this little company called Google. But take the time to ask yourself: What really is Google? A search engine? A self-driving car? The happiest place to work? An app developer? Whether you’re using Google as an advertiser and taking advantage of its advertising offerings, or if you’re responsible for a couple of the 5.5 billion searches made every day, there’s still probably a ton you don’t know. We can say this confidently because even our two ex-Google Co-Founders had a hard time deciphering Google fact from fiction. Keep reading to learn 7 things you probably didn’t know about Google and feel free to share your thoughts to our questions at the end if the comments! Raising money as a startup is by no means an easy task. In fact, it’s one of the hardest challenges you and your business will overcome and it’s what stops a lot of good business ideas from taking off. Our Co-Founders are no strangers to the startup world and they can relate to the struggles. This is what Google calls predictions but they’ve also been referred to as “autocompletions” and “suggestions.” For PPC advertisers, this is an excellent tool to see what people are commonly searching for. Soovle is a quick and free tool that lists suggestions across all search platforms. Nonetheless, there isn’t one solid reason that determines what suggestions Google provides. From what we know, it’s based on popularity, relevance, and user convenience. And Google isn’t the only platform placing importance on relevance. Rand Fishkin, Mr. Moz himself, recently came out with his 9 Predictions for SEO in 2018. He tallies all his predictions from the previous year, and if he ends up with a positive net score, he’ll go on and make predictions for the new year and if not, he’ll stop. If you ask us, we love Rand’s approach and how he holds himself accountable for the things he says and writes about (considering how much BS is out there). Google’s main retention and revenue tactic are to provide relevant and beneficial links to sites outside of their domain that people want to click so that they will return and make another search in the future. Algorithm-centric social media platforms, limit the number of external links by rewarding “content that keeps people on their sites.” The goal of both sides is relatively the same: provide users with relevant, high-quality content that keeps them coming back for more. Where you live and the language you speak can also play a factor in the suggestions you’re shown. Finally, if there’s a major cultural event or breaking news story, those can also impact what Google suggests. Google isn’t just trying to show off its $750 Billion market cap with all these perks – they KNOW that it increases their employee’s productivity and overall happiness. Soft-serve ice cream machines, unlimited snacks, and even optimizing lunch line waiting times (watch the video for the answer) are just some of the steps Google has implemented to make sure their employees are happy and hustling. A few ways we at AdHawk try to increase happiness and productivity at AdHawk include providing healthy snacks (we’re big fans of KIND bars and clementines), having an open-office layout to increase transparency and always having plenty of office doggo’s around to provide some mid-day stress relief. We’re working hard here at AdHawk! 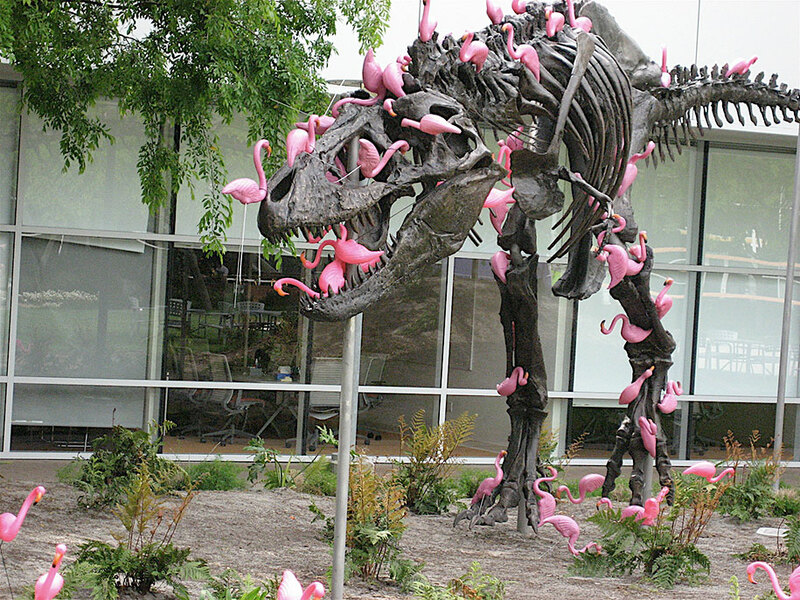 Stan was also the subject to one of the most innocent pranks in the world: being invaded by plastic flamingos. He made sure AdHawk and its employees operate with a similar mindset. No matter how great you think your business is at what it does, there’s always room to improve and if you get too comfortable for too long, it could all go away in a day. What’s your company’s version of Stan? While Google is long on its way to rule the world, you might be surprised to learn that there’s actually a company that owns Google. They’re called Alphabet Inc and in official business terminology, they’re a multinational conglomerate holding company which really just means they’re responsible for keeping Google and a couple other big brands under one big umbrella. In the year 2016, Alphabet Inc’s revenue, 63.8 Billion US Dollars, exceeded the GDP of entire countries such as Cambodia ($20.02B), Iceland ($20.05B) and Nicaragua ($13.23B) according to the World Bank. But how are they so successful? A majority of their profits comes from their golden goose, Google. This includes everything from Search to the Google-owned video platform Youtube. They’re also cashing in on their Google Homes, and smart-home products division under the Nest Company that produces and sells home-automation products like thermostats, alarm systems, and security cameras. The lesson? Never stop improving and diversifying! Onwards and upwards. Open up a new tab and type in gogle.com. Then try google.net. Do they both lead you to the same website? MAGIC! Just kidding, that’s no coincidence. Google, is always 10 steps ahead of the rest of us and bought the domains of common misspellings of its own name knowing that fact that people aren’t perfect. While your business might not have the budget to buy hundreds of domains to cover all your bases, there are still some things you can do to make sure searchers can find your company online despite inevitable human error. Using broad match keywords can be a good way to account for any misspellings or related searches of your brand or products. For example, if your company is Stax Crackers and someone types in “Stacks Crakers”, broad-match keywords ensure your ad is still eligible to be served. Beyond broad match, it’s probably worth experimenting with negative keywords as well to make sure your ad shows only when a user searches for something that is relevant to your business. Google bought Youtube at a record-breaking price of $1.65 billion back in 2006. This was great news for advertisers, as it consolidated search, display and video ad campaigns all within one Google AdWords account. At the time of the deal, Youtube was the most expensive purchase made by Google in its history. To date, it remains the 4th most expensive acquisition performed by Google coming only after Motorola Mobility, Nest Labs, and DoubleClick. It’s worth noting that the search giant has made nearly 200 acquisitions since 2001. Since its acquisition, Youtube has seen some incredible growth and currently stands as the 2nd biggest search engine, with Amazon rapidly gaining market share. YouTube debuted live-streaming video in 2011, grew niche markets that appeal to kids, beauty stars, and gamers, and rolled out successful ad formats to create another revenue generating machine. Free space optical communications? Balloon-powered internet? Whatever it may be, you can keep up to date with Google’s craziest ideas via their Moonshot Factory. Hate these facts? Love these facts? Are there any other fun factoids we missed? What do you think is close on the horizon for Google?